Australian based philanthropist, Michael Pawley, has donated huge amount of cricket items consisted of different jerseys for all age levels, batting pads, bats gloves, sweaters, track-suites and other assorted equipment to the KCC board. In a statement sent to KCC board via email, Pawley lauded the club for their relentless effort in ensuring they run cricket the way it should be with professional standards. “I’m impressed with the organization and the players at Kent Cricket Club. I wish you success and joy of playing cricket this season and the future”, he wrote. The 74-year-old philanthropist reiterated his support for Sierra Leone’s cricket development, adding he will send more items in March and would continue to send more consignment. He added: “My focus is Kent Cricket Club, but the items I sent will as well serve other purposes particularly with reference to school and women cricket which are equally important for the growth of the sport. If you don’t have a good foundation of young cricketers, you will not be able to produce a good cricket team”. “And that’s the fact I like about KCC, because youth’s development is their major priority and I stand with them and I will always support their club,” Pawley emphasized. Pawley, who played elite cricket for the New South Wales in his active playing career, was an Ex-mathematics teacher with B.Scs. Diploma in Education and a professional cricket coach. His philanthropist gesture doesn’t only stop at the donation of cricket items, but he is also helping greatly in the educational aspect as a partner of a rural village school in Cambodia. 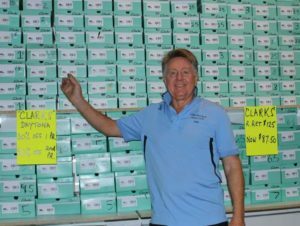 Based on his consistency in supporting needy people, the 74-year-old was awarded the Order of Australia Medal for Charity Work (OAM). Receiving the items on behalf of the club, the Chief Executive Officer, Emmanuel Pessima, not only thanked Mark Pawley for the gesture, but also stated that the donations was of great value to KCC and the Sierra Leone Cricket Association (SLCA). The CEO stressed that the equipment were an essential resource for cricket development. He said such donations provided young cricketers with a big opportunity to play the game. School cricket is an essential component at grassroots level. “That is where we all started, we excelled and went as far as playing senior and national cricket”. “These gears will help us to bring out the unknown talents that might become the next set of national players for the country. So, by all indications, KCC is the direct beneficiary, but the donation will reflect at all levels, as we will be presenting some to schools and other junior crickets clubs,” Pessima said. Pessima expressed gratitude to Michael Pawley, stating that he is a true philanthropist with huge interest to help promote Kent Cricket Club through his act of generosity and kindness. He said the club will be more than happy to receive more equipment and that they will make sure they use them for the intended purposes.